One of the best ways to meet people, develop relationships, and grow as a follower of Christ is to serve in some facet at the church. Whether it’s worship service, volunteer service, or just being there to help hand out bulletins, there’s always a need at Redwood. It is that time of year again! We are looking for servants to help us “spring clean” the church building. This can be an individual or a group of individuals, possibly a small group activity! Our goal is to have this project completed by April 10, 2019 (before Palm Sunday). If you are interested in serving in this capacity, please contact the church office at 483-9090. The Worship Ministry Team involves people who serve in more public ways like liturgists, readers, ushers, acolytes, and Communion servers, as well as more behind-the-scenes ways as visual arts/décor and Communion stewards. If you’re interested in serving in worship, contact Linda Verhoeff or contact our church office. Disciples growing disciples. That’s the work of a small group leader. Many feel that they cannot serve because they cannot “teach,” or “don’t have all the answers.” Leading small groups isn’t about having the right answers, but about having the right questions, and trusting God to work through small group community and Bible study. If you’re interested in becoming a small group leader, contact the church office. Our audio/video ministry is looking for some more people to help with Audio and media. If you are interested in serving in this capacity, please contact the church office at 483-9090. There are countless ways to show Christ’s welcome by serving with hospitality—everything from assembling visitor welcome bags, to making and serving coffee and goodies at the coffee hour after RISE worship. The Mugging Ministry is also a great way of showing first-time visitors Christ’s welcome by going by their house to deliver a coffee mug with goodies. If you’re interested in serving with Hospitality, contact Joan Gallante or contact our church office. This is a simple, easy way to begin serving at Redwood. Each week people are needed to help set-up the dining room, prepare and serve food, and clean-up afterwards—not to mention serving as greeters! If you’re interested in serving on Wednesdays at the Connection, contact Gail Price or contact our church office. Tabitha Ministers serve the Christian Community through nurturing and supporting brothers and sisters who are homebound, hospitalized or in nursing home situations. The ministry includes regular visitation, the mailing of weekly sermon CDs and bulletins, taking the sacrament of Holy Communion, and gifts of handmade Prayer Shawls for those who are homebound or facing tough circumstances. If you are interested in serving in this capacity, please contact the church office at 483-9090. We are seeking individuals to serve before each worship services as greeters. You will simply greet visitors, guests, and church family alike, offering a friendly handshake and a warm welcome. If you are interested in serving in this capacity, please contact the church office at 483-9090. Serving the young people of our church is a high privilege. Many hands are needed to bless the children—helping with Children’s Church, assisting in the Nursery, supporting a Sunday school teacher or the Connection Kids. There are also several large children’s events which require many hands-on-deck, such as the Easter Egg Hunt, or Trunk-or-Treat. If you’re interested in serving regularly with the Children’s Ministry, contact Valerie Brown or contact our church office. Please note that a screening/background check is required. People serve by hosting the meal, greeting, running media, cleaning-up, and playing in the band. If you’re interested in serving on Fridays at Celebrate Recovery, contact Tim Gearheart or contact our church office. Stephen Ministry is Christ caring for hurting people. Lay caregivers (called Stephen Ministers) provide one-on-one Christian care to the bereaved, hospitalized, terminally ill, separated, divorced, unemployed, relocated, and others facing a crisis or life challenge. Stephen Ministry helps our congregation to provide quality caring ministry for as long as people need it—in an atmosphere of confidentiality and trust. If you are interested in serving in this capacity, please contact the church office at 483-9090. Music is a strong and vital force in the life of Redwood Church. From the very young to the forever young there are opportunities for active participation or celebratory inclusion in various musical excursions throughout each week. 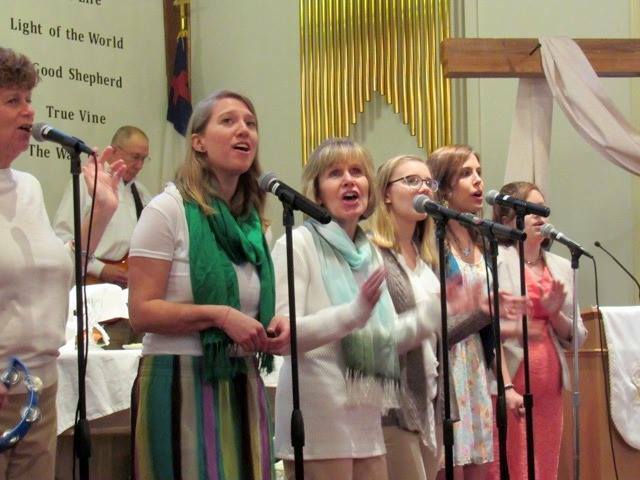 Our two strongly supported worship services every Sunday offer both the traditional choir and the contemporary praise band format for musical service. In addition to the weekly worship opportunities there are special performances where people can join in for holiday celebrations. Regardless of whether you enjoy singing in a choir, or you play an instrument, there’s a place for you somewhere in the joyous musical ministry at Redwood. The backbone of our youth ministry are unpaid servants who are adult counselors to the youth. The youth ministry also needs periodic support from persons to serve as chaperones for special events, retreats, mission trips, etc. If you’re interested in serving, please contact Jessi Fortner or contact our church office. Please note that a screening/background check is required. The church-owned bus seeks to enable more people to connect with Redwood ministries, as well as to provide transportation for Redwood groups that travel. A Commercial Driver’s License is required. If you’re interested in serving in this way, please contact the church office at 483-9090 or info@redwoodumc.org. Redwood people serve with the following community-based ministries, non-profits and agencies: Carilion Hospice of Franklin Co., Carilion Franklin Memorial Hospital Auxiliary, the Family Resource Center of Franklin Co., Franklin Co. Perinatal Education Center, the Free Clinic of Franklin Co., Habitat for Humanity, Heavenly Manna, Helping Hands of Franklin County, Lake Christian Ministries, Southern Virginia Child Advocacy Center (CASA Program), Stepping Stone Mission (Soup Kitchen). If you’re interested in serving, contact the agency directly, or contact the church office. Redwood always has need for help in its many facets of service. Hit a toggle below to open up more information about that particular service. Redwood offers a number of short-term mission teams, as well as disaster response work for those who are ready and willing to serve. We have active partnerships with missionaries and missionary work in Brazil and Ghana, as well as with STEP, Inc. of Franklin County. In addition, Redwood sends people to serve in local non-profits and agencies. Passionate about helping others? Contact the church office (483-9090 or info@redwoodumc.org) to see how you can be a part of this exciting ministry. Redwood frequently partners with RMES to help provide reading partners and lunch buddies for children who lack family support, or need extra attention at school. If you’re interested in serving, please contact our church office. This United Methodist mission in the Doe Run community of Franklin Co. provides daycare and after-school programming for children and youth. In the summer, the Center also hosts mission teams, and provides meals for the community. If you’re interested in serving, please contact our church office. Join us from April 13—18th as we travel to Beaufort NC. 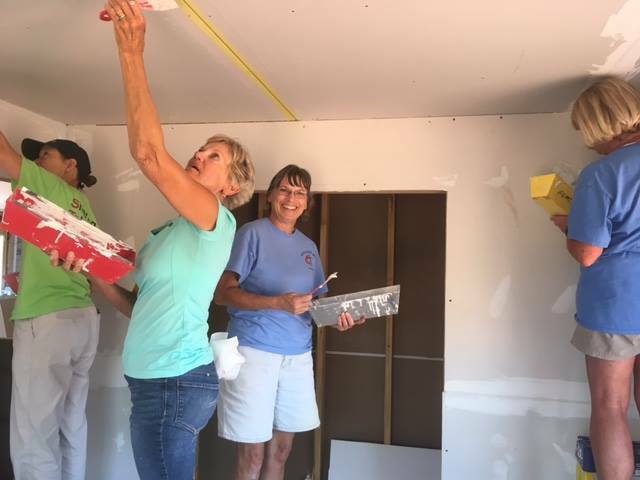 This area was hit hard by Hurricane Florence last fall and is beginning to transition from Early Response to Disaster Recovery and rebuilding homes that suffered damage. What a great chance to be the hands and feet of Jesus to a hurting world! This trip is being hosted by Bethlehem UMC and Redwood is joining in their efforts. If you are interested in this opportunity, please contact Carolyn Koontz at koontz77@aol.com or call our church office at (540) 483-9090. This ministry provides bags of food for 20+ students at Benjamin Franklin Middle School. On Fridays they pick-up a bag of nonperishable, easy-to-make food items to eat on over the weekend. If you’re interested in serving, contact Lori Suon or contact our church office. On the second Tuesday of each month, a team of Redwood servants prepares food for hungry people in Rocky Mount at the Stepping Stone Mission. Redwood supports the Mission in other ways, as well. If you’re interested in serving, contact Pat Horning or contact our church office. Once or twice a year we host the American Red Cross in soliciting blood donations from members of the community. We provide support for the canteen, as well as hospitality and reception. It’s a wonderful way to serve, save lives, and connect with people from the greater community. If you’re interested in serving, contact the Church Office. This women-empowering service group at Redwood Church raises awareness and raises funds for many different social issues and mission endeavors. A key component of the UMW is also mission education. The UMW usually meets on the first Monday of each month at 11 a.m. at the church. If you’re interested in learning more, contact Pat Horning or contact our church office. where Jesus Christ transforms them into world changing disciples. To connect the unconnected to a community of faith where Jesus Christ transforms them into world changing disciples.